Am I a Good Candidate for Facial Plastic Surgery? At some point in life, most of us are candidates for facial plastic surgery. But knowing when the time is right is a big part of making your experience the best it can be. The goal of facial cosmetic surgery is to provide a physical lift that also boosts self-confidence. We like to remind people that the decision to have plastic surgery, no matter when it occurs in life, shouldn’t be predicated on physical appearance alone. Cosmetic surgery, like many optional enhancements we make in life, won’t live up to its potential if you do it to look like someone else, chase a younger version of yourself, design a face for social media, or “keep up” with the Joneses. Likewise, it’s important not to make a rash decision about a facelift based on emotions alone. 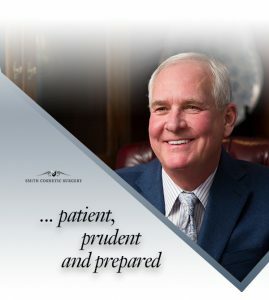 For example, we encourage our youngest prospective patients to make sure they’ve gained enough real-world experience; we ask those who find themselves single following a long-term relationship to pause before pushing the reset button; and we urge people of all ages to find a healthy state of mind when they finally commit to cosmetic surgery. 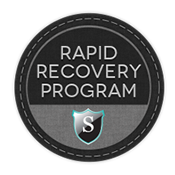 Guiding patients through this decision-making process is an extra step we take at Smith Cosmetic Surgery. Board-certified Denver plastic surgeon Dr. Brent J. Smith has been performing mini facelifts for more than 25 years and is able to recognize when someone is not in the right place to move forward with facial plastic surgery. It doesn’t mean that person will never be a candidate (as the modern mini facelift can be customized for nearly everybody); it just means the timing isn’t right. With that in mind, let’s look at some of the most common physical and emotional motivations we address with prospective patients at Smith Cosmetic Surgery. 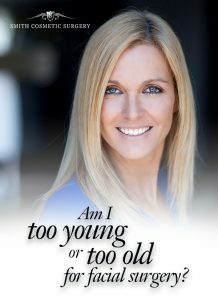 By far, the question we field the most is: Am I too young or too old to consider plastic surgery on my face? These days there is a trend toward considering plastic surgery at a younger age, as well as nonsurgical procedures like BOTOX to achieve a certain look. Plastic surgery in general is discussed more openly than ever before. We would never suggest that someone in their 20s, for example, is not a candidate for rhinoplasty or a mini lift. Dr. Smith performs many nose jobs among the younger set to help make one of the body’s most prominent features complement the rest of the face. He’s also performed his mini lift technique on women in their 20s and 30s who have benefited greatly from the procedure. However, we always guide our younger patients through a series of inquiries about their motivations for choosing surgery. Making a smart decision always comes down to this: If there’s something that’s always bothered you, such as a nose that’s never quite fit your face, then it’s the right time to make that adjustment. These kinds of physical concerns tend to escalate during puberty, when the body is going through so many other changes. Self-consciousness about inherited facial traits may also become heightened as young people enter the professional workplace or a specific job where they are regularly on display or in face-to-face communications a majority of the day. There are, however, some impulses that don’t always align with plastic surgery being a good option. It could be trying to fit in with those we perceive as “cool,” or trying to resolve an unhealthy emotional state through a physical change. In these instances, we work with younger people to develop patience while they work on deeper issues or to consider nonsurgical options that could refresh their appearance and help prevent some early signs of facial aging. For example, regular BOTOX treatments can go a long way in preventing fine lines and wrinkles from setting in prematurely. Then, at the right moment later in life, a mini lift really may do wonders. On the flip side, we encounter many prospective patients who wonder if they are too old to have a facelift. We like to say that you’re never too old to stop aging in its tracks. If a person is in good general health, there is no reason men and women in their 50s, 60s, 70s and even 80s can’t have the appearance they dream of. Dr. Smith specializes in cosmetic surgery of the face to give people of all ages a new lease on life. There’s no expiration date on wanting to look our best. To date, the oldest person to have facial plastic surgery at Smith Cosmetic Surgery is an 89-year-old female. She’s a shining example of what our senior patients can achieve later in life. After running some baseline tests to assess an older patient’s ability to undergo the surgical procedure, anesthesia and healing process, we set realistic expectations for mature clients. A mini facelift on a 70-year-old will never look like one on a 30-year-old. Like all areas of the body, the skin on the face becomes less elastic and the underlying muscles weaken over time. So where a younger patient may see results that seem to last longer, older patients will notice a slight softening of results sooner. That said, facelift recipients will always look more youthful than they did pre-surgery. 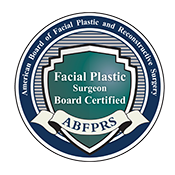 Even with these guidelines it can be hard to discern when to have a facial plastic surgery procedure. Every person is different. People come to Smith Cosmetic Surgery in different physical and mental states of health. And the decision to have plastic surgery is very personal. Denver facial plastic surgeon Dr. Brent J. Smith knows the best outcomes occur when a person is patient, prudent and prepared for surgery. Putting physical appearance aside, are you otherwise pleased with the person you are? Does feeling like you look older than others—friends, parents, coworkers, family members—frustrate you? Looking deeper, are you actually trying to fix something else (failures or frustrations in relationships, work, parenting, etc.) by “fixing” your face? Are you captivated by the ways others perceive or judge you? Or do you think you have a healthy self-image that emanates from within? Have you ever been through any surgery before? Do you feel prepared both physically and mentally for the procedure? These are just some of the questions it’s important to ask yourself before scheduling a facial plastic surgery procedure at Smith Cosmetic Surgery. Dr. Smith has been performing facelifts for well over two decades. He knows that the best outcomes occur when an individual is patient, prudent and prepared. If you’re considering facial plastic surgery or nonsurgical options to rejuvenate your appearance, please call Smith Cosmetic Surgery at 303-741-2211 or contact us online to learn more about our services or schedule your personal consultation.